Sismo Soluciones has announced the NEW "FIRE WARNING PANEL - GOLD LINE" with aluminium casing, made with the components which are resistant and FULLY operative. Probably the most professional product and it is really very similar to the real one. It's compatible to be used with Sismo's Pedestal Stand and other stands made in scale 1:1. For more information see below and also visit Product page. The new version of the OPENCOCKPIT’s simulation software, SIOC, is already available for download. This new version besides of touching up some bugs, optimizes the performance of the IOCards, provides new functions and adds more devices to be controlled. 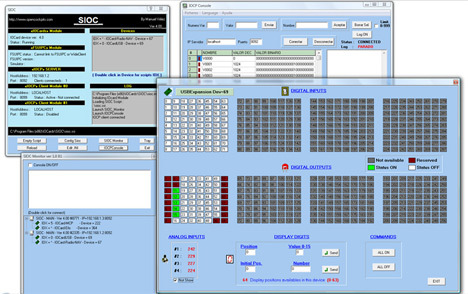 The new version implements an special communications protocol via UDP, that allows the remote control of all electronic cards connected to any SIOC in the same network.